Two of my parents’ closest friends are Ralph and Willa Dean Hurley of Sneedville, Tennessee. They attended church together for many years at Duck Creek Baptist Church in Sneedville, where Ralph and dad served as Deacons and dad occasionally led the singing with Ralph playing the piano. I was searching for their contact information for my mother, and found this article at https://www.citizentribune.com/news/history/back-when/article_ed22e8f6-9b81-11e7-abd2-8b1c600dac95.html about Ralph and the Duck Creek Quartet. Morris and Sandra Hurley, along with Shelia Simmons, suggested I do a story on Hancock County’s nationally acclaimed Duck Creek Quartet, and their 56 years of singing together. This was a good reason to make a trip to one of my favorite destinations. Sam Myers is a friend of Ralph Hurley, the last living original member of the group, and went along for the visit. Heading to the Duck Creek section of the county, we soon came to the handsome Hurley hilltop home, which has a splendid frontal view of Newman’s Ridge, as well as a beautiful scene of the Clinch Mountains at the rear of the house. Ralph and Willa Dean Hurley would welcome us into their home, where Sam and Willa Dean visited while I heard Ralph’s story. 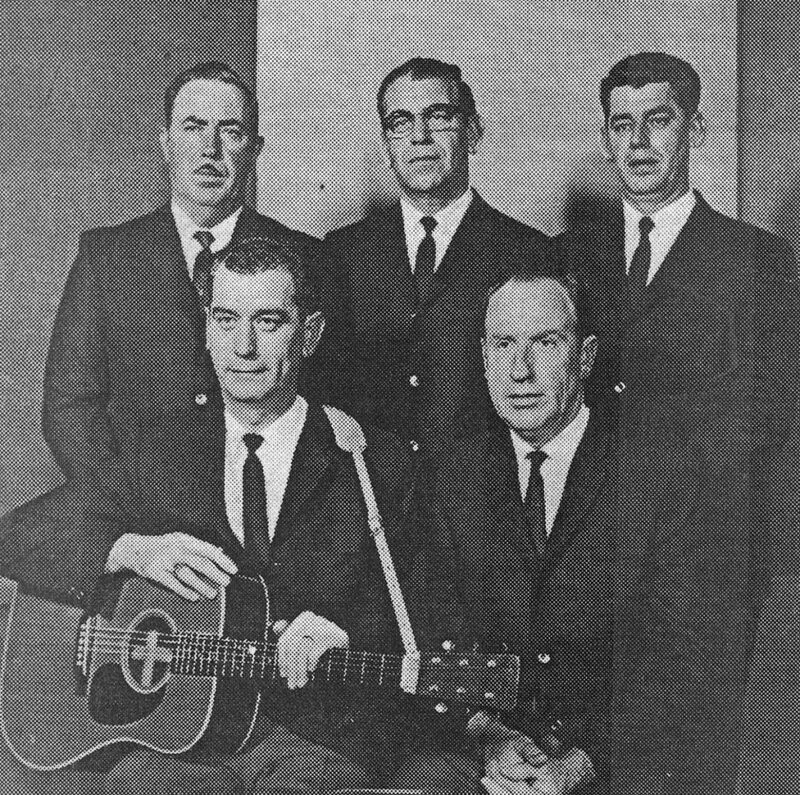 Original members of Hancock County’s Duck Creek Quartet, c. 1968. Front row, Ralph Hurley and Hubert Wilder. Back row, Kyle Wilder, Dewey Hurley, and Calvin Hurley. Born 1929 at Hancock County’s Yellow Branch section, Ralph was the youngest of Marion and Tennessee Lawson Hurley’s four sons and a daughter. Circumstance had bred a work ethic into young Ralph, who would work for land owners for 50 cents a day. That ethic would take him much further than he could have imagined as a young man. Hancock is alive with musical talent. A popular pastime in the area was singing conventions and singing schools that taught shaped notes. Sam and Ralph would later roll off some names of the old singing teachers that included Willis Hurley, Ray Elkins, Ralph Debord, Tillman Shockley, Tandy Harville and Millard Singleton. “They taught us the notes first,” explained Sam. Beginning school at Duck Creek Elementary, Ralph would graduate from Hancock County High School in 1949. Heading off to Lincoln Memorial University, he would be there for three weeks when he received his draft call. After three months at Camp Kilmer, New Jersey, Ralph boarded a ship for Germany, where he endured a three days and nights trip on a flatbed railcar fitted with benches to arrive at Sandhofen, Germany. He recalled seeing “just a bunch of steel posts sticking up” from recent World War II damage. After two months at Sandhofen, he was sent to the Rhine-Main Air Base in Frankfurt where he was assigned to a Special Services photo lab where he would supervise two German men and a German woman. One of his jobs would be to teach photography to pilots. He told that he was treated well by the German people and would stay in the country for a little less than two years before returning to Camp Dix, New Jersey to be discharged in 1952. Returning to Sneedville, Ralph and his brother Dewey would open The Farmer’s Market, where they would stay for six years. They would then start the Hurley Insurance and Real Estate Agency, where Ralph would focus on general customers and auctions, while Dewey worked with the Nationwide Company. Auctions were a big business for the company and Ralph told that during a 10 year period they would average an auction a week. After 15 years in that business Ralph had the opportunity to buy controlling interest in the Citizen’s Bank of Sneedville Bank from Martha Collins, the bank president. While Dewey would remain in the real estate business, Ralph would serve as president, CEO and owner of the bank, where he would retire in 1994. Shortly after graduating from high school, Ralph had attended an ice cream supper at Hancock High when he met a very pretty Willa Dean Lawson. “She absolutely struck me at that moment,” he told. The two did a cake walk together and would not see each other until he was soon in the Air Force. In basic training he would write her a letter, which was quickly answered. Following his discharge, they dated until their now 62-year marriage would begin in 1955. The Hurleys have a son, Scott (Ladonna) who is an attorney in Knoxville, a daughter, paralegal Jody Wormsley, and grandchildren Blake, Holly, Jordan and Parker, as well as great-grandchildren Willa and Ruie. Ralph had first attended the Yellow Branch Baptist Church, but moved to Duck Creek Baptist in 1938 when he was 9 years old, and where he’s still a member. The youngster had taken a few piano lessons and “the Lord just give it to me” he told. At age 9, he would begin a 45-year stint of playing piano three times a week for the church. Ralph had also played with a musical group, The Gospel Sounds, with Dwayne Wilder and Hopie Hopkins. The group did so well that they played with Lester Flatt and Earl Scruggs during a Sneedville performance. The Duck Creek church had a tradition of family singings where the still 9-year-old Ralph would join with his brothers Calvin and Dewey, along with his cousins Kyle and Hubert Wilder to form the Duck Creek Quartet. Five in the group made it possible for one to be absent. After Dewey’s death in 1984 Tim Wilder would join the group until the group finally retired in 1994. In the group’s early years it was common to find churches that frowned on stringed instruments, but Ralph would gradually add a guitar, while another guitar, a harmonica, and a bass were sometimes used. Throughout the quartet’s existence they would continue to rely heavily on a repertoire of their traditional singing school songs with their bouncy tempos. The quartet would soon get noticed and in 1941 were invited to sing at station WJHL in Johnson City, where they would return several times. They would perform regularly with Rev. Johnny Coffey on Morristown’s WCRK radio station, where Johnny McCrary was the announcer, as well as other radio stations. Other appearances have been in North Carolina, Baltimore and Detroit, as well as with Ralph Stanley and on Preacher Mull’s television show. They would be signed by King Records and in 1986 their acclaim attracted the attention of the Smithsonian Museum, which invited the group to represent the State of Tennessee in its two-week American Folklife Festival. It’s a common Hancock tradition to have food for visitors and as our visit was winding down, Willa Dean invited us to her kitchen table which looks out on Clinch Mountain. On her table was hot apple dumplings topped with vanilla ice cream, chocolate graham crackers spread with cream cheese, and a wonderful relish dip with vegetable chips. Plates were piled with second and third helpings. Still a businessman, Ralph fills his days with buying and selling stock. “I lose some and gain some,” he ended. Church remains important to the Ramsey’s and they continue to regularly attend their nearby Duck Creek Church.